We can make use of the normal probability distribution to further analyse the element of risk in capital budgeting. 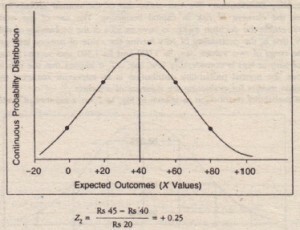 The use of the normal probability distribution is enable the decision maker to have an idea of the probability of different expected values of NPV, that is, the probability of NPV having the value of zero or less; greater than zero and within the range of two values, say, Rs 1,000 and Rs 1,500 and so on. If the probability of having NPV of zero or less is considerably low, say, 01, it implies that the risk in the project is negligible. Thus, the normal probability distribution is an important statistical technique in the hands of decision makers for evaluating the riskiness of a project. The normal probability distribution as shown in Fig. has a number of useful properties. The area under the normal curve, representing the normal probability distribution, is equal to 1 (0.5 on either side of the mean). The curve has its maximum height at its expected value (mean). The distribution (curve) theoretically runs from minus infinity to plus infinity. The probability of occurrence beyond 3o, is very near zero (0.26 per cent) ..
For any normal distribution, the probability of an outcome falling within plus or minus 1o from the mean is 0.6826 or 68.26 per cent. If we take the range within 2o, (X ± 2o,) the probability of an occurrence within this range is 95.46 and 99.74 per cent of all outcomes and lie within 3o, of the X. Assume that a project has a mean of Rs 40 and standard deviation of Rs 20. The management probability of the NPV under the following ranges: (i) Zero or less, (ii) Greater than zero (iii) Between the range of Rs 25 and Rs 45, (iv) Between the range of Rs 15 and Rs 30. The figure of indicates that a NPV of 0 lies 2 standard deviation to the left of the expected value of the probability of possible NPV. Table Z indicates that the probability of the value within the range of 0 to 40 is 0.4772. Since the area of the left hand side of the normal curve is equal to 0.5, the probability of NPV being zero would be 0.0228,. that is, 0.5 – 0.4772. It means that there is 2.28 per cent probability the NPV of the project will be zero or less. (ii) Greater than zero: The probability for the NPV being greater than zero would be equal-to 97.72 percent, that is, 100 -2.28 per cent probability of NPV being zero or less. The area as per Table Z for the respective values of -0.75 and 0.25 is 0.2734 and 0.0987 respectively. Summing up, we have 0.3721. In other words there is 37.21 per cent probability of NPV being within the range of Rs 25 and Rs 45. (It may be noted that the negative signs for the value of Z in any way does not affect the way Table Z is to be consulted. It simply reflects that the value lies to the left of the mean value). According to Table Z, the area for respective values -1.25 and -0.5 is 0,3944 and 0,1915. The probability of having value between as 15 and 40 is 39.44 per cent, while the probability of having value between as 30 and 40 = 19.15 per cent. Therefore, the probability of having value between as 15 and Rs 30 would be 20.29 per cent = (39.44 per cent – 19.15 per cent).